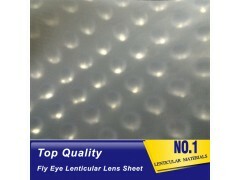 it is looks like flys eyes,so we call it fly-eye sheet,we can all it dot 3d sheet too.it is different from cylinder lenticular sheet. Anyone interested in the Flys Eye Dome design? On March 3rd , 1908, physicist Professor Gabriel M. Lippmann (1845-1921) proposed the use of a series of lenses at the picture surface instead of opaque barrier lines. He announced this to the French Academy of Sciences under the title La Photographie Integral. He was able to record a complete spatial image with parallax in all directions. The process utilized an array of small spherical lenses, known as a flys-eye lens array (a screen that consisted of a tremendous number of small convex lenses), to both record and playback the image. Use Advertising,construction and decoration,printing and packaging,stationery,gifts,LED lighting,ect.